First comes love, then comes New Jersey, then comes the rigors of a presidential campaign. 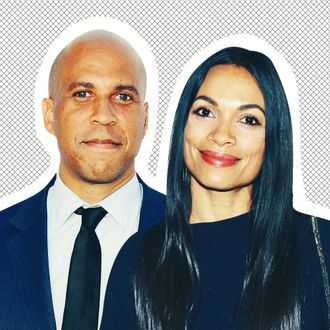 The above is a song I just composed about New Jersey senator and Instagram poet Cory Booker, 49, and Sin City actress Rosario Dawson, 39, who are, as Dawson confirmed to TMZ, dating and in love. While she was walking through Washington’s Reagan National Airport, Dawson was asked if there was any truth to the rumors that she and Booker are in a relationship. “Yeah. We’re — Yeah. Very much so,” she replied. She also said it was “so far so wonderful, he’s a wonderful human being,” and that she’s “grateful to be with someone that I respect and love and admire so much.” She also pointed out a Booker campaign button on her bag. This is the first official confirmation that the two are dating, although they were spotted at the movies together in New York City in January, and that same week, Dawson was reportedly seen singing “I love you” to the senator at a performance of Dear Evan Hansen. Then, in February, Booker made two equally big announcements: the first, that he would be campaigning for president in the 2020 election, and the second, that he has “a boo.” In the second announcement, which he made during a radio interview with Charlamagne tha God, he did not say who the “boo” in question was (it was probably Dawson!) though he did say that he thought she would make a good first lady. Dawson did not comment on her partner’s choice to wear billowy-fit denim.